Armand Nannini Obituary - Cornwall-On-Hudson, New York | Quigley-Sullivan Funeral Home, Inc.
Armand J. Nannini, of Cornwall, NY entered into eternal rest on September 23, 2016 at Wingate at Beacon, Beacon, NY. He was 93 years old. The son of the late Enrico and Fernanda Nannini, Armand was born on October 11, 1922 in Jersey City, NJ. Armand was a Machinist for Union Carbide in Sterling Forest, NY and an Equipment Operator for Callahan Nannini Quarry in Salisbury Mills, NY. 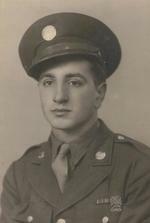 Armand honorably and proudly served his country as a member of the U.S. Army during WWII and played a part in the Battle of the Bulge, the Normandy Invasion and the Liberation of France. He was a member of the Mountainville Engine Co. #3. A family statement reads: “Armand was a generous and supportive man who brought humor and kindness to his family every day. His three grandchildren and their spouses and seven great grandchildren were a huge part of his life and they brought him endless joy. Throughout the years, he spent countless hours sharing WWII memories, mowing grass, and rooting for the NY Yankees and NY Giants. We are forever grateful for his kindness, compassion and sincerity”. Armand was predeceased by his loving wife, Carmella Ruscitti Nannini. He is survived by his son Robert A. Nannini, Sr. and his wife Leslie; his grandchildren, Robert, Jr. and his wife Noreen Nannini and their children Ryan and Macie, Jay and his wife Sarah Nannini and their children Oliver, Leo and Cooper, and Leigh Nannini Rivas and her husband Oscar and their children Ronin and Owen. Armand was also predeceased by his brothers, Louis and Edward Nannini. Memorial Contributions in Armand’s name may be made to Mountainville Engine Co. #3, Starr Road, Mountainville, NY, 10953.